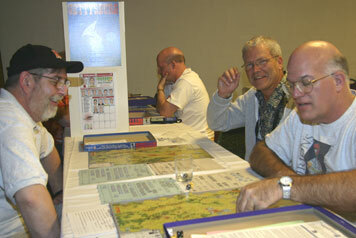 Bill Thomson (left) takes time out from Squad Leader to push some rebels. Is GM Vince Meconi (left) playing both Greg Smith and John Sharp simultaneously? Ed Menzel of Fullerton, CA successfully defended his Gettysburg '88 crown, defeating Dave Zimmerman of Myerstown, PA in the Final. Ed finished with a 7-3 log while Dave ended 4-2. Dave has now been the runner-up five times at the WBC/Avaloncon Gettysburg tournament without winning. Defending PBEM Champ Barry Shoults (Attica, MI) took third with a 4-1 mark, and last year's Rookie of the Year, Doug Porterfield of Bristow, VA (3-1) had an excellent sophomore outing to finish fourth. Preliminary games were played from Sunday, 7/29 (thanks to the Grognard Pre-Con) through Friday, 8/3. Friday night, the 13 players who had played the required minimum of three games to qualify for the Final 4 were ranked, with the top four advancing to single-elimination. The top four were, in order, Ed Menzel (5-3), Dave Zimmerman (3-1), Barry Shoults (4-0), and Doug Porterfield (3-0). Doug and Barry were the only players to go undefeated in the free-form Swiss rounds. The final foursome wasn't locked up until Barry Shoults defeated Jim Tracy late Friday night; had that game gone the other way, Jim would have advanced instead of Barry. The GM at 5-2 tied Doug for the 4th playoff spot, but Doug won the tiebreaker because he defeated the GM in a preliminary round game. Other players who won at least 3 games were 6th, Jim Tracy (4-2), 7th, Bill Thomson (5-2), 8th, Ted Drozd (3-3), and 10th, Greg Smith (4-7). In the Saturday semi-finals, #1 Ed Menzel faced #2 Barry Shoults, and #3 Dave Zimmerman squared off against #4 Doug Porterfield. Due to previous games played between the semi-finalists, this was the only combination that avoided a rematch. Ed Menzel took the Confederates against Barry Shoults without a bid. The two battled it out for six hours and 15 minutes - the tourney's longest game - before the South prevailed. Both players and spectators agreed that the game was a slugfest; no finesse involved. 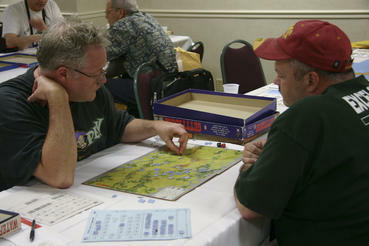 In the other semi-final, Dave Zimmerman, bidding 4.5 for the Confederates, prevailed over Doug Porterfield. The Rebels ground down the Federals steadily, scoring a 54-24.5 automatic victory at the end of July 2. In the Final, Dave Zimmerman signed on for the Confederates in exchange for a bid of 5.5. Earlier in the tournament, Dave's Southern forces clobbered Ed's Yankees, but a repeat was not in the offing. This time, Ed's Union army had the Confederates on the ropes early, eliminating Rodes' infantry division on Turn 3. At the end of July 1, the Union still held all victory hexes on the board. Several more turns of heavy losses for the Confederates forced their resignation on Turn 10. 10 or 52%. The average bid was 1.97 for all games and 3.22 for those games in which there was a bid. Champ Ed Menzel also garnered Best Confederate Player laurels with a 5-1 mark, while Barry Shoults and the GM shared Best Union Player distinction at 3-1 each. Bill Banks was Rookie of the Year with a 2-2 mark and a 9th place finish. Thanks go to a terrific quartet of Assistant GMs: Ted Drozd, Jeff Lange, Ed Menzel, and Greg Smith.